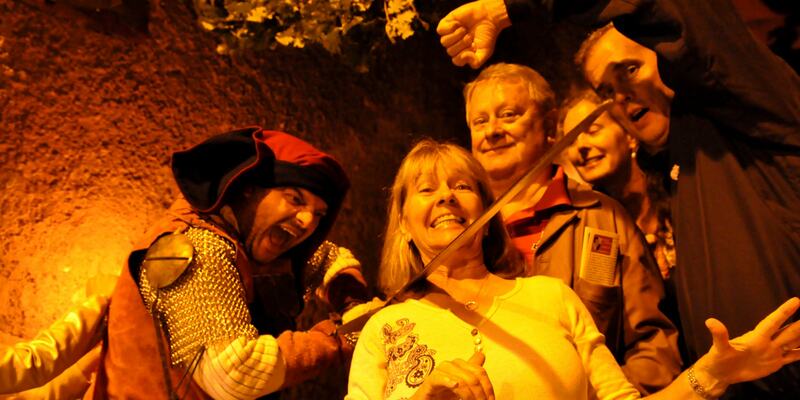 Two Weeks Only In October - Experience the Magic of our Medieval Festival & Harvest Season! 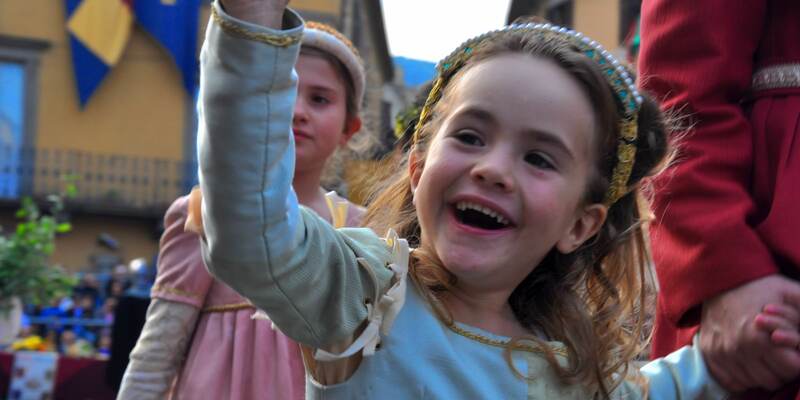 Experience the Magic of Soriano's Medieval Festival During the Autumn Harvest Season! The hot days of summer have given way to cooler temperatures. Wine-grapes have matured and are ready for harvesting. The changing season also brings changes in the landscape. The green leaves along rows of grapevines are beginning to turn to a light hue of red and orange. Chestnuts are in abundance in the hills surrounding Soriano nel Cimino - Our Central Italy hilltop destination for this special week of festivals, food, wine, cooking and amazing excursions. 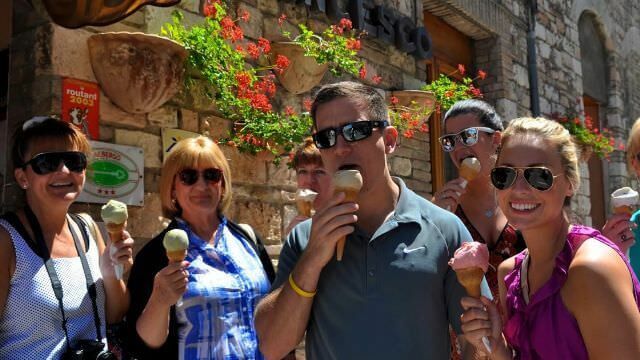 You will live along side the locals in small-town Italy for an 8-Day, 7-Night All-Inclusive Vacation week with a small and intimate group of around 16 guests. This week you will embrace Italian-Festival life, Traditional Italian cooking and cuisine utilizing locally-sourced products. 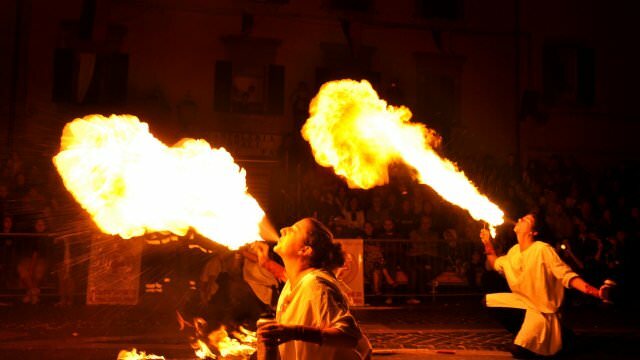 Known to Italians throughout the country as one of the best of its kind, this annual festival has been a tradition in this hilltop enclave for over 50 years. The build-up prior is as amazing as the festival itself. 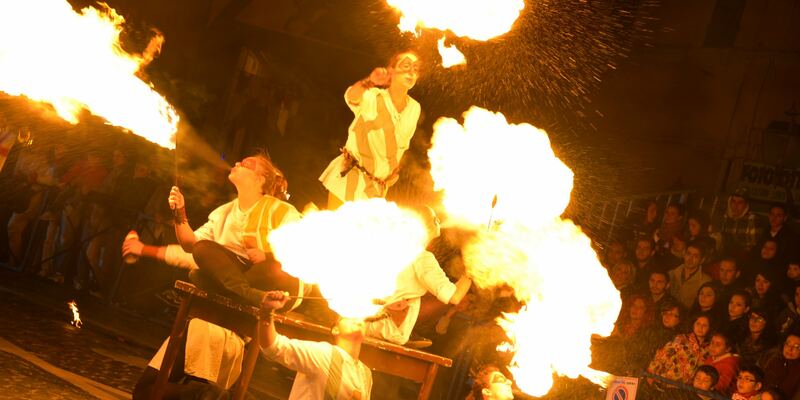 During most of September, the town transforms into the Medieval wonderland that is the backdrop for this wonderful festival that takes place during the first two weekends of October. The pleasant aroma of chestnuts roasting on wood-pit fires fill the air as Friends, Romans and Countrymen (truly) come to admire the decorations, pageantry, shopping at the fair as well as the wonderful local foods at the many taverna that are built specifically for the festival weeks. You will be a part of the local pride that each Contrade or clan, if you will, represents the four distinct neighborhoods of Soriano. Each has its own detailed costumes and themes, colors and specialty. The Rocca Contrade have amazing swordsmen. 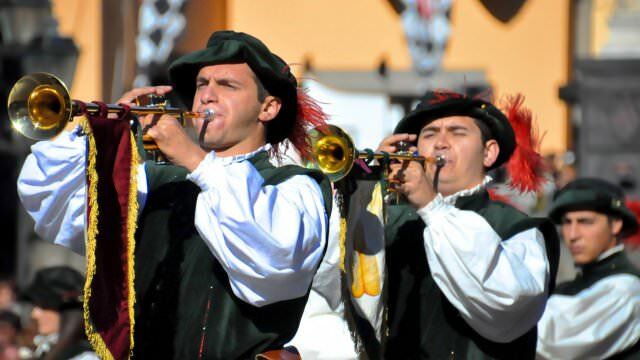 The Papacqua Contrade have incredible trumpeters and drummers. 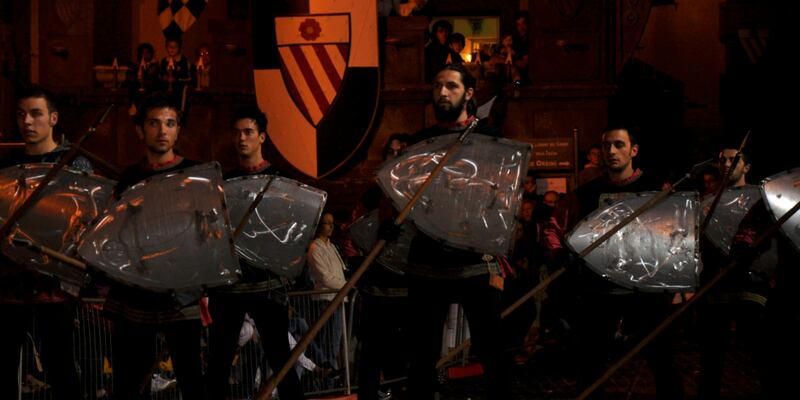 The Trinita Contrade have fantastic flag throwers. And the Saint Giorgio Contrade has remarkable decorations and re-enactments of life during the middle ages. 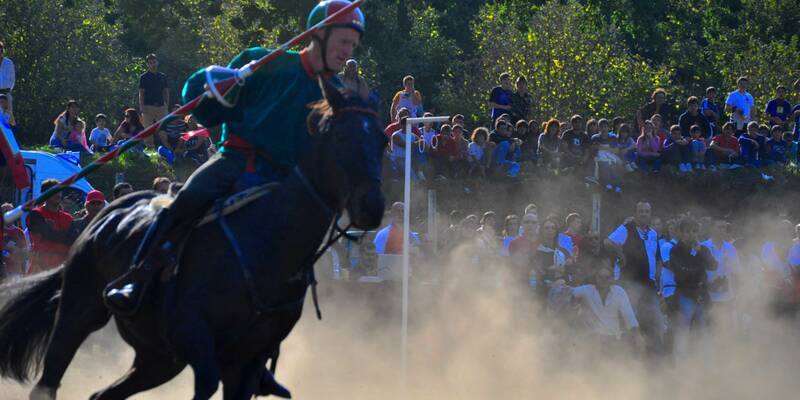 Throughout the festival, the contrade fiercely compete for a series of prizes, the most significant of which is called the Palio; a coveted banner awarded to the contrada that wins the yearly jousting & archery competition. This week is truly special and one that we look forward to every year. We all support our own contrade and wear the colors proudly. We're pretty confident that you will have your favorite by the end of the festival, too! It all happens just this one scheduled vacation week in October. We'll have three completely hands-on cooking classes this week. Our cooking classes are not demonstrations. They are 100% hands-on. We structure them so that you can be as involved as you desire in every stage of every course we prepare. So, when you're ready, we will get wrist-deep in our kitchen as we make locally-sourced, farm-to-table recipes using ingredients such as flour from a family-run mill in Umbria to make, from scratch, Home-made pastas like Pappardelle and Ravioli. We'll also use it for our pizza class on Friday night! We use free-range chickens for our Tuscan Roasted Chicken made directly in our wood-burning oven. Our sauces are made with mostly with home-grown, seasonal vegetables including, zucchini, celery and onions and eggplant. We'll make ricotta and pecorino cheese with a local shepherd...And so much more! For those would rather eat than cook, there is always something to entertain you. All of our classes take place at our beautiful 18th century country villa. Take control of our 90-bottle wine rack, relax, take a stroll, or just enjoy the wonderful Italian countryside. Whether you are cooking or not, the time we spend during the cooking classes is always a highlight. When we are not cooking, we are heading out on some truly incredible outings and excursions. 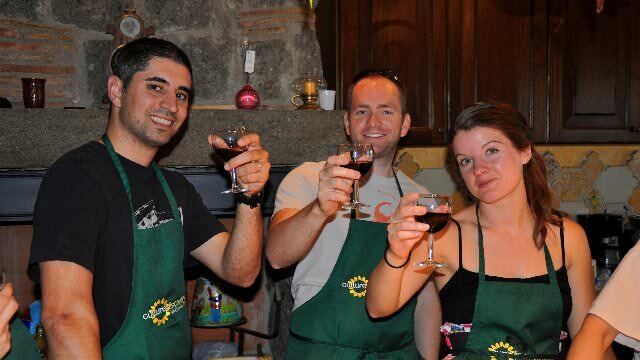 We'll visit some amazing wineries, including small family-run places where we will meet the owners and dine with them. We'll have dinner where the wine cellar is widely-considered to be the most beautiful cellar in the world. We'll have lunch at a small home-based olive mill that makes arguably, the best Extra-Virgin Umbrian Olive Oil you will ever have! We'll visit a generations old, operational Deruta ceramics factory where we try our hand at the potter's wheel. We'll see many other beautiful-beyond-description Italian gems such as Assisi, Orvieto, Pienza and more! 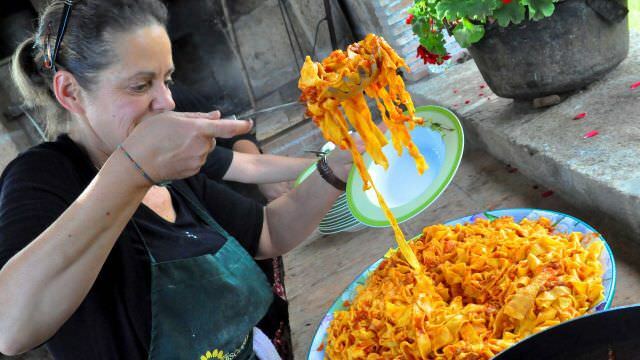 Italians love their food. And why wouldn't they? It's delicious! We love it too and so much of what we do revolves around meal planning! We're talking about lunch at breakfast and then talking about dinner during lunch! One thing you never hear during one of our vacation weeks is, "I'm hungry" - What we do hear is..."I can't eat another bite!" But they still find some room! The wine is always flowing at lunch and dinner. We take a lot of pride in making sure that we're pairing the right dish with one of the fantastic local wines. Everyone has their preferences. Find out which ones you like best! Additionally, the meals at our cooking classes are not little "learn to make pasta" classes like many others. Instead, the classes are traditional Italian 'Sunday Family Meals'... Some are 5 courses, all done to the max. Other classes highlight Italian Desserts and Pizza! When the week is over, you will have experienced the real Italy that few tourists have ever experienced. You will have made new friends, and you will have learned why Italian culture is so amazing... because you will have lived it. Home cooking...Away from home. Welcome to the Real Italy. Several of our meals will be home-cooked, home-served. 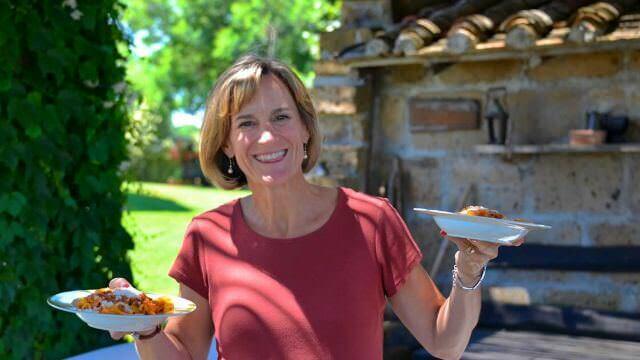 That is, we are dining with local residents in their homes, villas or "taverne", truly sharing in their lives, and being part of everyday family life in an Italian village. It doesn't stop there. Each morning when you "take" breakfast at the cafe in the main piazza, you will be welcomed with friendly smiles and a Buongiorno from the baristas. Don't be surprised when they know your specialty drink or pastry by the next day! Your daily encounters with locals will leave a lasting impression not only on yourselves, but also with the locals as they really love our guests and the interaction that takes place. They are as genuine as it comes and you will feel it from the moment you arrive until the time to say goodbye. It's not just in town where you will have this opportunity. Down at the villa, we have visitors come often to join us for lunch or pizza night. When we go to the wineries and the olive mill, we are at their personal homes and not some touristy stop where mainstream companies go. This will most-likely be unlike anything you have experienced when traveling. You are invited into people's homes and lives and will be welcomed in as if you have known them for years. 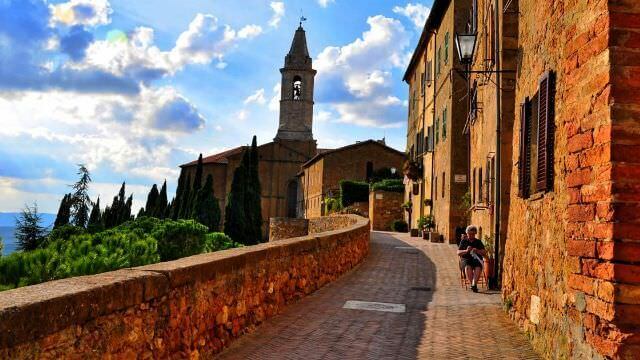 In Tuscany, we will visit the villages of Montalcino, Montepulciano, Pienza, and Castelnuovo d'Abate. We will visit small family-run wineries and have an amazing home-made lunch in Montalcino at the home of our dear friend (and Brunello Winemaker),and dinner in what has been labeled as "The Most Beautiful Wine Cellar in the World" in Montepulciano. Umbria...Figuratively and literally, sits in Tuscany's shadow, yet evokes emotions of what Tuscany was like before all of the tourists arrived. 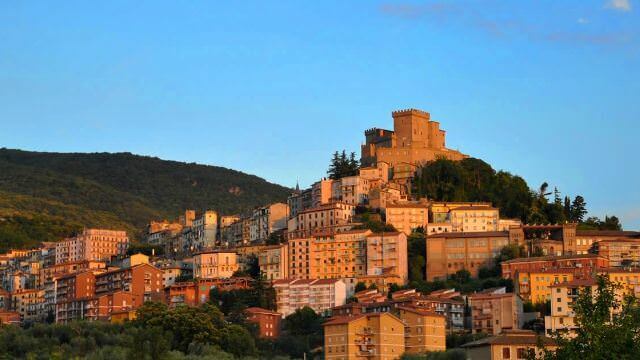 Your journey to Umbria will bring you to some incredible towns with unforgettable experiences. One of the true gems and remarkable places in all of Italy is the Basilica of St. Francis in Assisi. You will have plenty of time to stroll through the picturesque walkways in this beautiful, historical town and marvel in the magnificence of the basilica. When we go to Deruta, we have an exclusive experience at the factory and showroom of a family-run studio. You can take your turn at the potter's wheel at this generations-old Italian ceramics factory. Deruta is known around the world as home to some of Italy's most iconic and recognized designs. 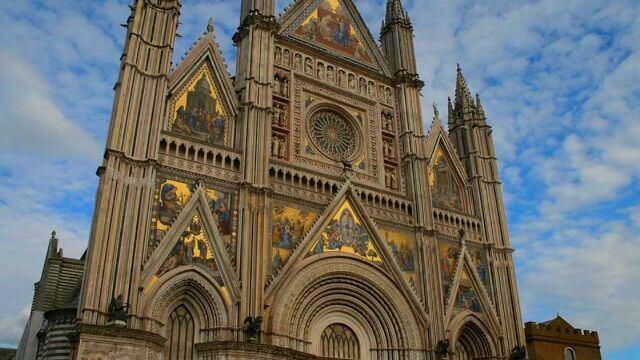 One of Umbria's best-kept secrets isOrvieto. Along with a renaissance-inspired interior, the remarkable, gold-laden facade is recognized as one of the most beautiful examples of gothic design and architecture. We have a fantastic visit for shopping and lunch in this historic town. We find many of Central Italy's hidden treasures in the area of Alto Lazio - locally known as Tuscia. This is a mostly Roman area, yet borders parts of Umbria and Tuscany and has influences from all three regions. Our home base of Soriano nel Cimino which lies in the foothills above the Tiber Valley, was a strategic outpost beginning in Etruscan times and over the years has built a very storied history. In Civita di Bagnoregio we visit the remarkable, Dying City, named that for its history of having most of the town crumble away leaving it nearly abandoned for decades. We'll visit the beautifully preserved medieval quarters of the City of Popes in Viterbo, which was also an historic seat of the Vatican. Another amazing highlight of the week and true gem in the area is the time we spend at a winery and olive oil mill in the rolling hills of Castiglione in Teverina. A traditional Sunday Family-Meal - On Monday! As an addition to our scheduled classes, during this week we'll be visited by a local shepherd who will need our help to make fresh Ricotta and Pecorino cheese. 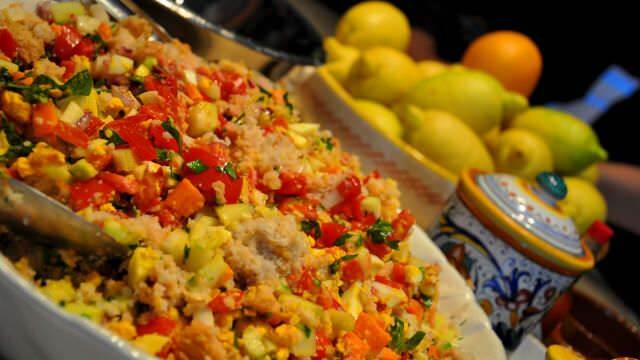 We fire up the cauldron and stir the pot as we learn how to make these regional specialties. The Ricotta or Pecorino cheese we have been using this week was made like this with our guests. As we make it, you will have the chance to taste this fresher-than-fresh, just-made ricotta cheese with a locally-sourced honey made by friends of ours. It is truly sensational! Class 3 Is Our Traditional Pizza Night at the Villa! 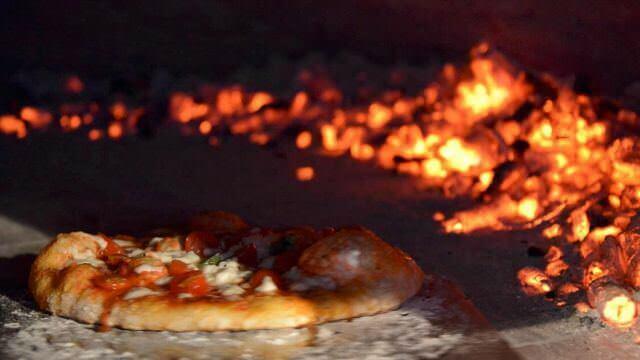 We prepare the dough together, as well as all of the toppings as we fire up our 500 year old wood-fired brick oven! Each guests will have the chance to make their own individual pizza with toppings of your choice. It's a regional and Roman tradition to make pan-pizzas. We'll help Carla prepare several types of them. Such as...Margherita Pizza, Sausage & Porcini Mushroom Pizza, Caramelized Onion Pizza, Cherry Tomato Pizza, Zucchini Flower and Cream Pizza. Even a dessert pizza made with the fresh ricotta cheese we've made and also includes a home-made, Nutella-style, hazelnut and chocolate spread. Medieval Chestnut Festival: Reserved Seating at Shows and Fair Meals.